While past performance is no guarantee of future results, the Morningstar Return shows how the fund has done in the past in comparison to similar funds in its peer group. It does not, however, show the effects of risk.Therefore, the Morningstar Return is most helpful when used in conjunction with the Morningstar Risk Score. For example, an investor could use these two scores when comparing between funds that have the same Morningstar Star Rating and similar Morningstar Risk Adjusted Returns but different levels of risk. 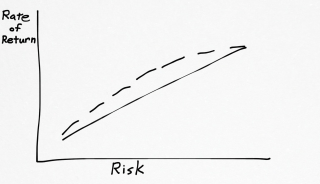 You mean high-variance, not risky. Just throw your money into companies from OTC.BB, VTX, friends of friends, Nigerians who solicit you via email without doing any due diligence if you want to take on extra risk. If I wanted extra returns in an index fund over a very long time frame I would invest in emerging markets because it’s easier for them to grow (barring, ahem, —risks).